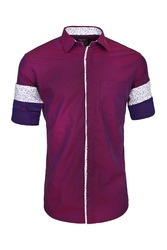 With the help of our expert team members, we have been able to provide Men's Semi Formal Shirt. Christian Fabre Shirt Collection Is Sure To Shake Up Your Wardrobe Printed(Paisley)Over-Dyed Shirt With Short Point Collar, Tape Detailing On The Placket And Contrast Chain Stit'H At Back Yoke. Ready-to-wear shirts for work hard and play harder men. Range covers work wear and evening wear.